Craig Elliott is demanding Boston United give the fans a performance they deserve. The Pilgrims host York City in National League North action on Saturday, desperate for the three poins that could kick-start a play-off push. “If we can sort our home form out and get a few good results we can be where we want to be,” Elliott said. “We’re looking to try to have a big second half of the season. That’s the thing, we’re thereabouts and we want to kick on. “It’s a big game and we want to get the crowd behind us. 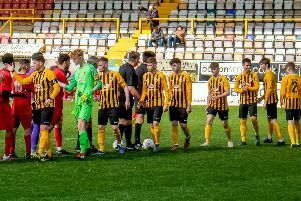 Sunday marked the one-year anniversary of Elliott’s first win in the Boston dug-out, a 2-1 home win over the Minstermen which spurred the side on to an impressive second half to the campaign. And Elliott hopes history can repeat itself. The Pilgrims will be without injured duo Ben Middleton and Jordan Thewlis (KO 3pm).